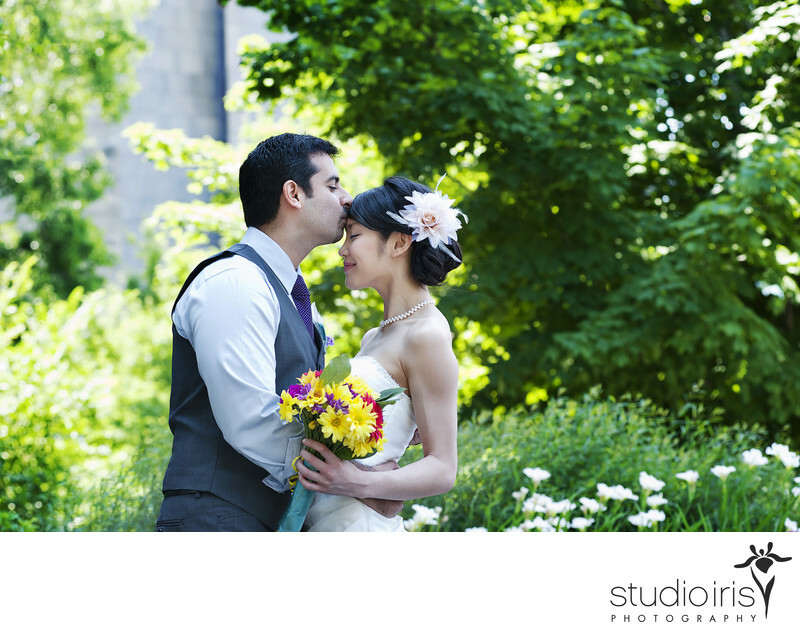 Old Montreal is one of the best places for wedding pictures in Montreal. With its historic European-style buildings, narrow cobblestone streets and pretty horse drawn carriages, the Old Port is one of North America’s most stunning historical districts. The area is dotted by beautiful parks, monuments and amazing views of the St. Lawrence River. .In this photo, it was quite early in the day, so many of the beautiful old buildings were in full sun, which does not work well in photographs. Instead, I headed around the side of a building to the shade, and used some trees in the background for luscious wash of green behind the newlyweds. .After this, we met up with the bridal party, and did some fun photos wandering along the cobblestone streets. .The wedding was at Gallery Gora, a contemporary art gallery in downtown Montreal. A funky, loft-style space, it was the perfect venue for this poet and professor. .